It’s no secret that I love a little bit of black in an interior. At the risk of sounding like a broken record; Black is bold, beautiful, iconic and a classic addition to any interior. I have shared some ideas before on how to embrace the colour en masse , (Read about it here) but certainly that dramatic look is not for everybody. One of the ways Black is appearing in design now is in fixtures and hardware. It can stand out in a bright space and ground another. 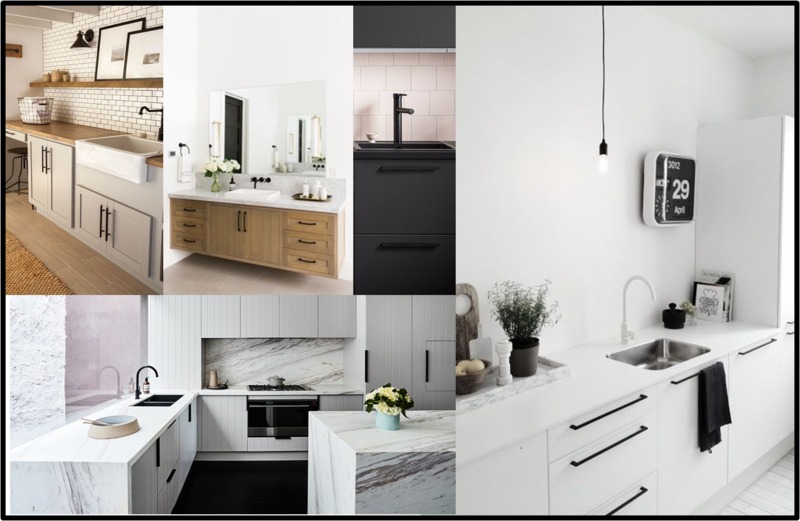 With hardware and fixtures tending to come in just a handful of finishes and colors, this emergence of black is a welcomed option, which I believe will not just be a fleeting trend, but just like the LBD: forever timeless. 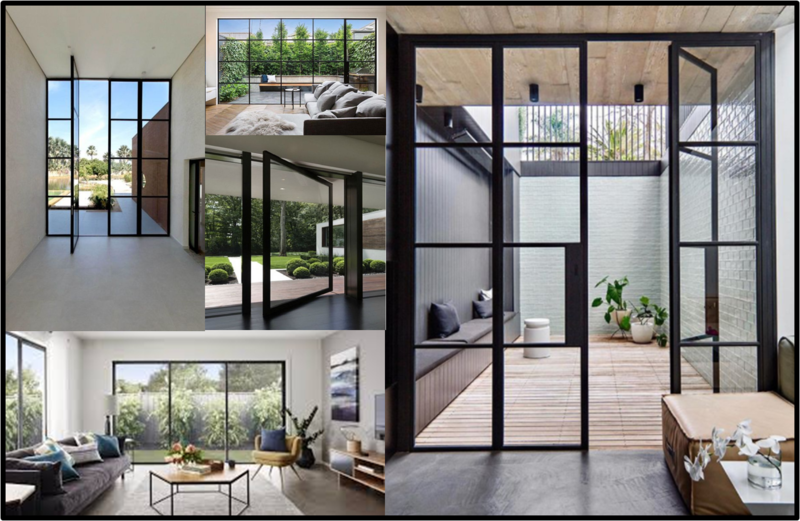 A black window and door frame can really frame the view outside and turn it into something special. It also adds drama and style to a space which I just love. The dark against the light outside just pops! Black frames do favour a more contemporary aesthetic, but this look can also look quite at home in a more classic styled interior too. 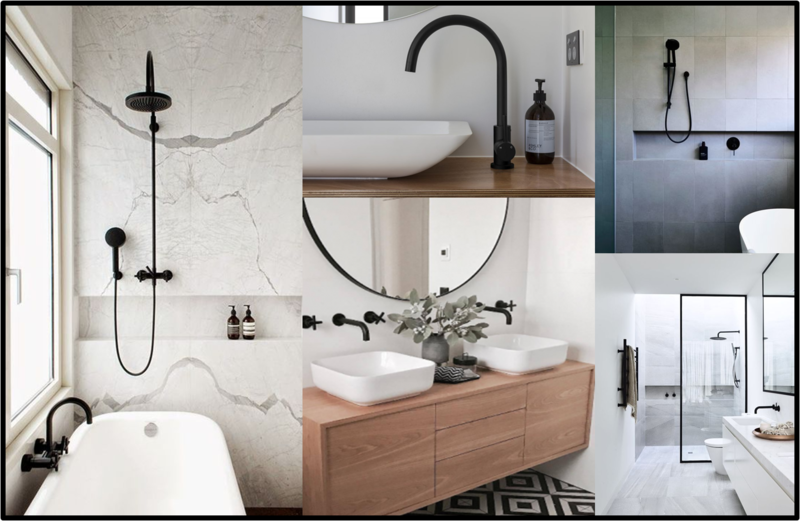 I am totally crushing on this look and cannot wait to do a bathroom with black taps for a client! (Any takers out there?!) I think this look is so chic, and really adds something so special to a very utilitarian and naturally ‘stark’ room. 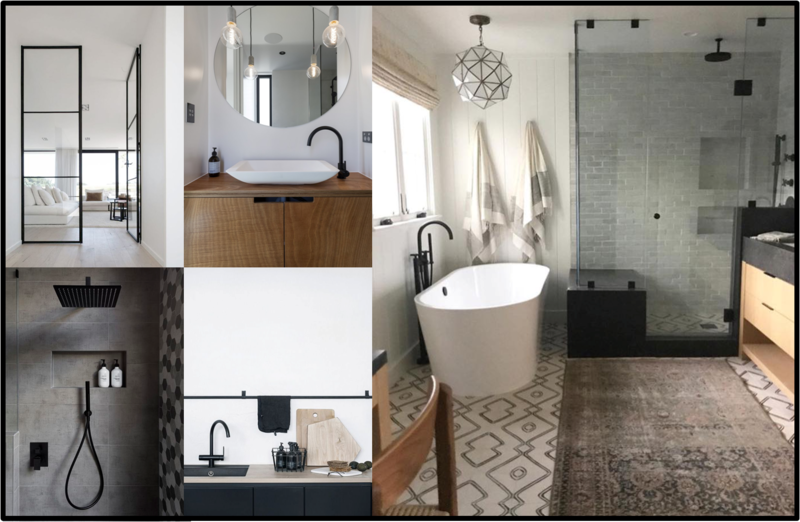 I love how the taps become the main feature in a very minimalist bathroom, and what a beautiful contrasting detail they provide in a more textural layered bathroom. Matte black fixtures will compliment any colour scheme or material. Pairing textured timber with smooth black tapware helps to bring out the wood’s beautiful natural grain. It works a treat with go-to bathroom materials like marble and granite and tiles. Black tapware is very versatile and looks great in contemporary, classic or rustic styled bathrooms. Cabinet hardware is the little detail that can have a big impact on the overlook look and feel of your kitchen or bathroom. I recently specified black handles for my beach house kitchen. I had used a combination of white and grey-smoked timber for the cabinets and felt that stainless steel would just look too stark for the look I was after, and just a little too predictable. The black handles give the kitchen a more bespoke feel, and authenticity which enhances the relaxed contemporary aesthetic I was after. I just love the way they turned out and will not hesitate to use blank handles in an appropriate interior again. If there’s one design element that has been having a major moment lately, it has to be gallery walls. Whether it’s big, small or somewhere in between, creating a gallery with your favourite prints and art pieces can instantly elevate the style of any space. I recently moved my toddler from her cot into a bed. This called for a little room makeover, so this weekend (Flu and all!) 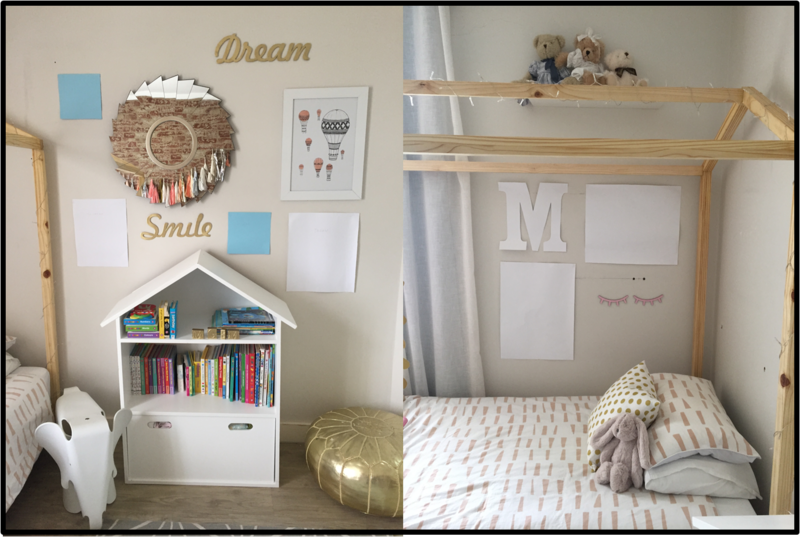 I decided to do a little gallery wall in Mackenzie’s room and would like to share with you some tips on how to do one yourself. I had been collecting prints and pieces for Mackenzie’s room for quite some time, and some of the pieces had been in her room since she was born. 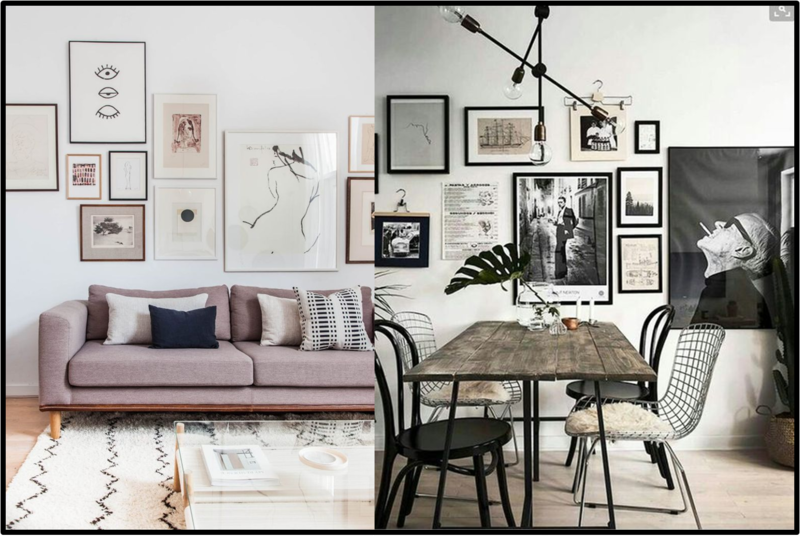 (I really like rooms that are “age neutral’ – but more about that another time) I think the most successful gallery walls are ones that combine a variety of art mediums and frame styles. If you’re looking for a foolproof way to make sure your art works together, choose pieces that have a common thread—a certain color for example. But you don’t have to limit yourself. The most important thing is for your wall to represent you—your tastes, your history, and the art you love most. 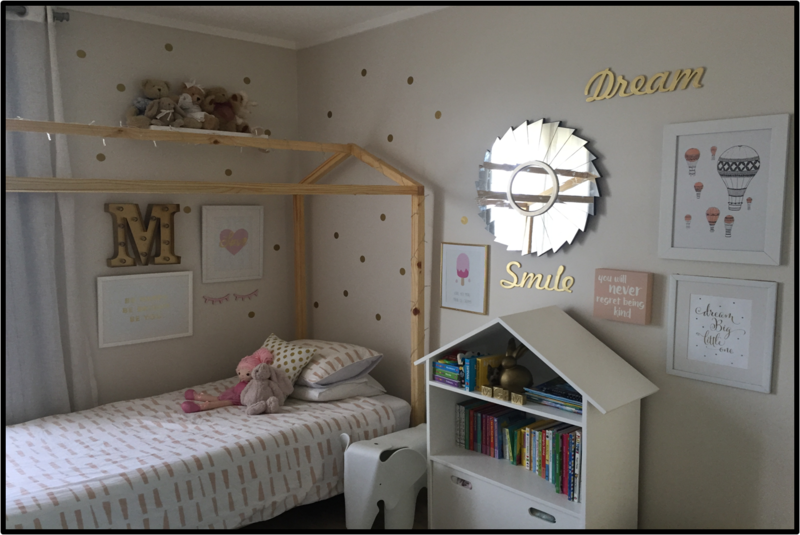 In this case, Mackenzie’s room is a colour palette of gold, peach and pinks, so the prints and pieces all have that in common. I used a variety of frames, and different shaped pieces too which I think is key to achieving the right look. 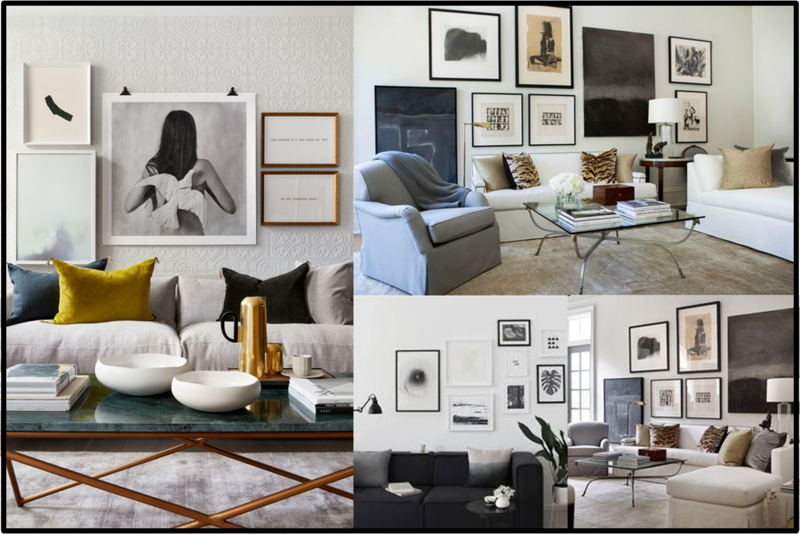 When it comes to gallery walls, size does matter! More important than focusing on the art type or scheme, it’s often the combination of sizes that makes or breaks a gallery wall. The key is making sure you start with a couple of larger pieces to anchor the wall. In my case I had a big round mirror that had to stay where it was (Hiding an awful TV plug and cords!) So I had to build my gallery wall around that. If you don’t have one large piece, group two together for the illusion of a larger work. Once you’ve placed the largest piece, build off of that from the centre outwards. 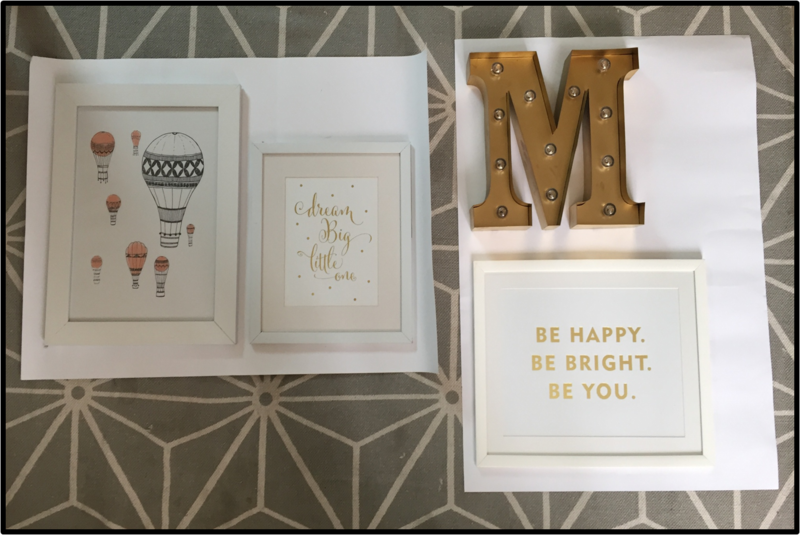 Groupings look most cohesive when frames are spaced tightly, however if there is an extra large piece in the mix, give it a little extra room to breathe. 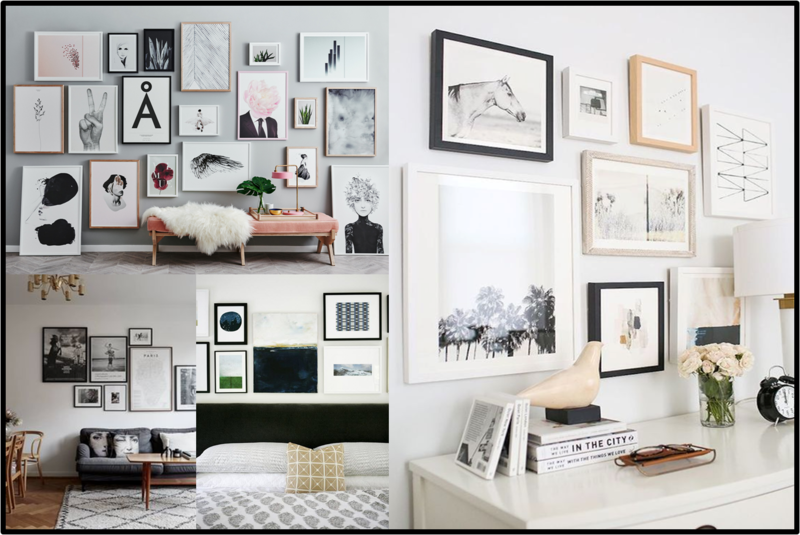 With regard to height, I recommend limiting the height of your gallery wall to two to three works, top to bottom. This generally keeps your art at eye-level. Of course ceiling to floor gallery walls are super dramatic too! So if you have the room to handle it, that will look fabulous! While the final look appears casual and uncalculated, there is actually a method to the madness. Creating a wall gallery is no easy feat. That’s why I’ve put together some tips below to teach you how to hang a wall collage with finesse. In retrospect I wish I had made a video tutorial to show you this, but hope my not-so-professional Iphone pics will suffice! 1. I took each artwork and traced it onto card which I cut out, to make templates. 2. I then used Prestick to stick the templates onto the wall and try out different layout options. This is key, and despite been a tedious and time consuming process with all the cutting and sticking etc. (Especially when you have a toddler trying to ‘help!’) I really recommend you do this with all your art prior to hanging it. Big tip: Multiple frames look best when based around the following shapes: rectangle, diamond or square. Straight set rows are nice too. If you opt for straight, use a piece of string stretched between two pushpins as a guide along with a level to make sure it’s straight. 3. Once you have your layout, you then need to do all the measuring to hang it onto the wall. I was quite lazy and used ‘No More Nails’ to stick some of the lighter pieces up. My husband drilled some holes for the heavier pieces (It was a really family affair) and I used my new favorite DIY tool: the Hilti picture hanger, and did some myself! And there you have it- a gorgeous gallery wall! PS. How cute is the House bed! 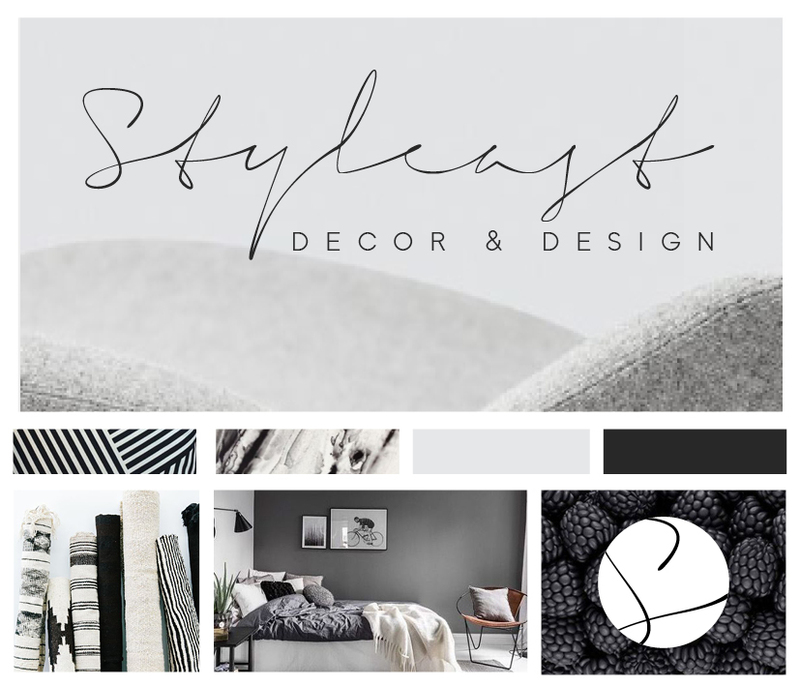 I am just so over the moon to unveil the new look for Styleast. I have been wanting to re-brand for quite some time now, and been collecting a folder of inspiration for almost 2 years! The time never felt quite right – I was busy building houses, having babies, juggling projects, and life carried on. Whilst I was on my recent “baby break” though, I was able to really think about the direction I wanted to take my business to and so, with the new “E-Décor” service Styleast will be offering, (Read all about it here) I see this as new start for Styleast, and the time to re-brand just seemed so fitting. I think branding is so important, especially in a creative industry, so wanted to make sure that my brand was epitomizing the design ethos of Styleast –minimalistic in approach, stylish and contemporary. I knew I wanted to the logo to be clean and uncluttered , simple yet sophisticated. And whilst I thought long and hard about colour, I could only see Styleast in monochrome: black and white. I had all these ideas flying around my head and had been doodling and playing around with the graphics myself but realized I need some professional help to bring my ideas to life. So that’s when I contacted Taryn Gaylard of Taryn Long Design. I have worked with Taryn before on other projects and just knew she would see my vision and create something beautiful for me, and I couldn’t be happier with the outcome! So here it is, the new and improved Styleast! 1. Describe the Styleast brand and the direction? Styleast is one of my favourite brands to date!! It helps having clients that have a similar style and taste, and trust you to do what you feel will work. LOVE the font, love the monochrome and love the fact the logo can be used with textures, beautiful photos and pretty much anywhere. Because of it’s simplicity, it has endless opportunities for the branding and development of the brand. I studied Media, Communication and Culture at University, with a few graphic courses and really LOVED it. So while travelling Asia, I did a bit of freelance work for a few friends and family and fell in love. It’s incredible to be able to bring someones idea and branding to life. Minimalist – I far prefer simple, beautiful designs, uncomplicated yet effective. 5. Is there an interior that you just love? And why? The different styles, seeing special pieces, mixed textures, plants, baths, tiles, art, the list is endless. While I love clean modern graphic design, I’m a sucker for eclectic and interesting homes, that really show a families personality. Taryn Long Design is also on Facebook and Instagram. Let me know your thoughts on the new look, I’d love to hear your feedback!